The holidays have come and gone, but the bitter cold has stuck around. After family gatherings and shopping for presents you’ve been exposed to a lot of germs, and it’s pretty likely you got sick. While there is sadly no cure for the flu and the common cold, there are some steps you can take to ease your symptoms and bounce back stronger. If you are dealing with a cold and need some extra help dealing with it, call Chicagoland Complete Healthcare today. We want to help you feel your best! One of the biggest things that prolongs sickness is a lack of rest. It’s easy to talk yourself into working through a cold, but your body needs rest to fight the illness. Not to mention you’re incredibly contagious. Don’t risk getting others sick! Curl up with a nice book or that show you’ve been wanting to watch and let your body get to work. You won’t be at your best when you’re sick, so it’s not worth trying to work through it. Call into work or school and get some much-needed sleep. In order for your body to do its job, it needs to be well hydrated. The trouble is, nothing dehydrates you quite like the flu. It doesn’t only have to be water though; tea, juice, and even chicken noodle soup all do wonders for hydrating you. When your respiratory system is hydrated, it’s able to thin out the mucus that has been building up, making it easier for you clear from your throat. That’s a very good thing — if too much mucus builds up in your lungs, it can cause an infection. When you have a fever, it’s a sign that your body has cranked your internal temperature up to fight your illness. Body aches and pains are a common symptom of the flu as well, so you can treat both aches and fever with an over-the-counter medication like acetaminophen or ibuprofen. It’s important to note, you should never give aspirin to someone younger than 19. It has been connected to a condition called Reye’s syndrome, which is a serious illness that can cause damage to the brain and liver. Consult with your doctor to find out which medication would be best for you. The fastest way germs spread is through coughing and sneezing, which the flu causes in droves. If coughing is what you’re experiencing more, it can be treated with over-the-counter cough medicine. You can try what is called an expectorant, which turns mucus into liquid, which clears your throat up, making it easier to breathe and preventing coughing. 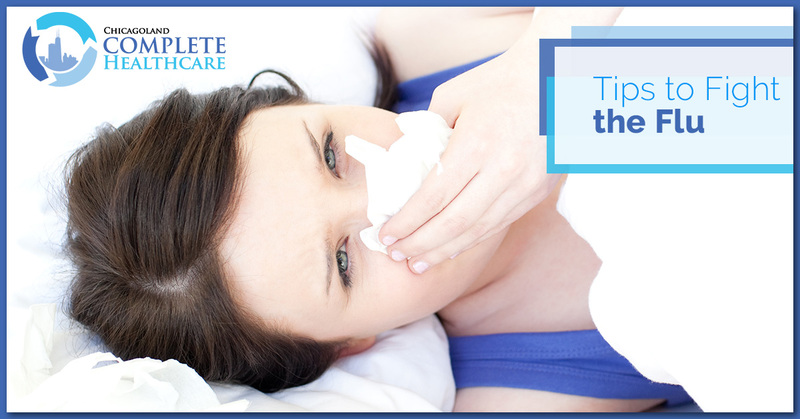 As for sneezing, antihistamines have shown positive results in clearing up nasal cavities. Never give over-the-counter cough medicine to children under four years old. A natural treatment that helps many people is steam treatment. Fill up a sink with really hot water, add in a teaspoon of an over-the-counter menthol rub, and breathe in the steam for several minutes. Alternatively, you could use a drop or two of eucalyptus oil with similar results. You can also do this with a hot shower or bath. While it isn’t necessarily proven that this works for everyone, it can help open your airways, clear congestion, and make it easier to breathe overall. If the air in your house is very dry, it makes it hard for your respiratory system to stay hydrated. By using a humidifier, you add moisture to the air, which helps ease congestion and cuts through coughs. Make sure it is not a warm mist, as it can promote the growth of mold and bacteria. It’s also important to keep your humidifier clean so mold doesn’t develop within it. If a humidifier gets moldy, it’s not only unable to do its job properly, it will actually make your health worse! You can find saline nose drops or sprays at any grocery store or pharmacy. They are incredibly effective in clearing nasal passages of mucus and they’re safe no matter your age. They’re especially helpful when you have a sore throat and aren’t able to take medicine orally without pain. Put several drops into one nostril, then gently blow the mucus and saline out. Repeat the process on the other nostril until both sides are no longer blocked. It might feel a little weird at first, but we’re sure it’ll help you breathe easier. Antivirals are medications you take when you first start to show symptoms. They can lessen the effects of the flu, and shorten the length of time you’re sick. Call your doctor as soon as you start experiencing symptoms, as antivirals work best within 48 hours of symptoms showing. Nobody likes to be sick, especially when you’re starting off a new year. If you are experiencing any of the symptoms listed above, call us at Chicagoland Complete Healthcare today. You deserve to feel better!